Top 4 Portable Solar Kits ~ Aim For The Sun! Portable panels built into complete solar charging kits allow the end user to have an easy solution for charging that does not require the permanent installation. Battery charging and charge regulation is controlled by an included solar charge controller. Learn more details about these effective yet portable units by reading our Portable Solar Guide. The top 4 kits we have listed for you here include 80 and 120 watt models with variations in cable length. This variation tends to be super important when trying to catch some rays and some shade at the same time. We will continue to add new models to the selection as they become available. Solar Tip: Get more solar than you think you need. You will almost always eventually need more charging power. Portable panels offer easy solar for off grid battery charging in a simple kit. 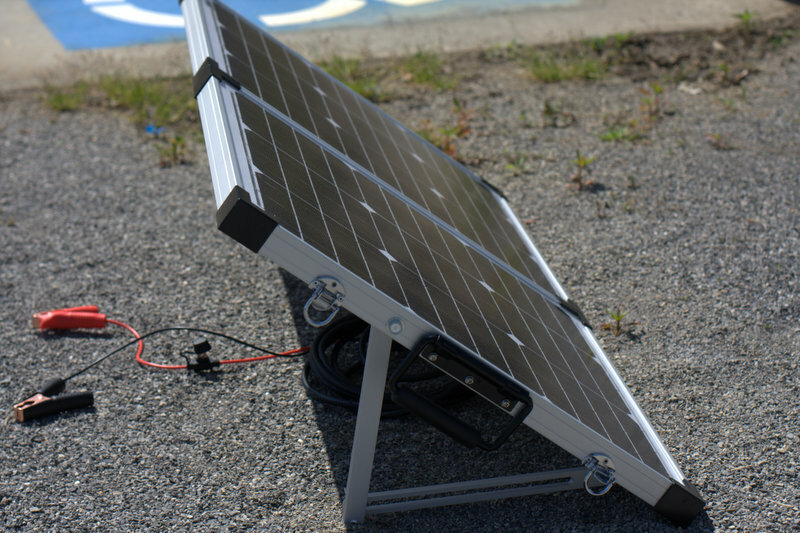 The solar portable battery charging panel produces DC electricity and the panel includes legs and brackets to allow for easy orientation to the sun. Once in the sun, they should be aligned to face south to capture as much power as possible. These solar panels are easy to set up and are a great choice for solar battery charging in off grid applications like camping, RV, houseboats and tailgating. Many of the solar portable units include tote bags for easy carrying and storage. Optional solar wires and trailer adapters are also available to better meet your needs when dealing with shading and also connection to your battery. For years we have used the Lean To Solar Calculator article to create a reliable portable solar panel setups using regular panels and building materials paired with some and a little sweat equity. Today, there are a couple really good portable solar options on the market that are ready to go as a kit. These solar panels when set in direct sunlight charge your batteries and are perfect when going off-grid or even when your RV or vehicle is in the shade. Be Green with Portable PV (Photo-voltaic Solar) while camping, hunting, fishing or even just tailgating. Solar will keep you charged and the portable setup will allow you to be the hit at your event. Portable solar panels can be a great choice for many small campers like teardrop trailers, T@B campers, canned hams, Airstreams and other recreational vehicles and trailers where permanent installation just won't work. They are easy to stow and don't take up much room because they are meant to fold in half. The controller for the system is usually installed on the back of the unit and will provide years of worry free battery charging. 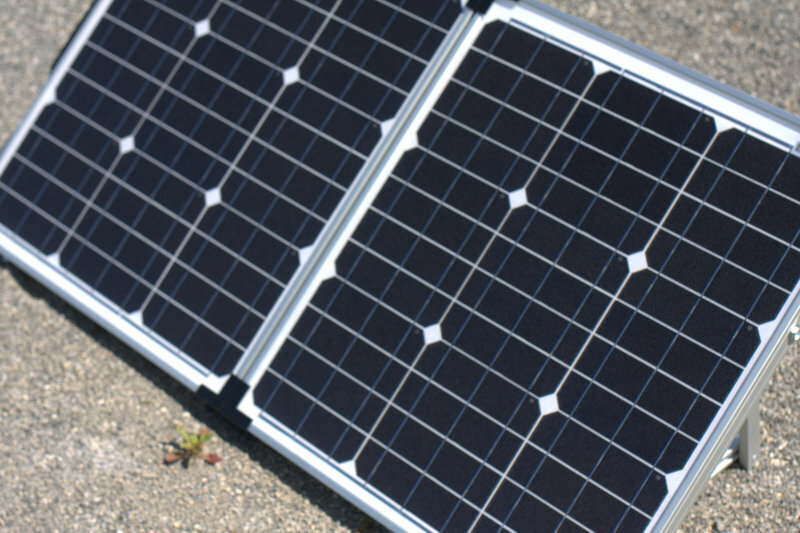 Learn more about The Hows and Whys of Portable Solar before you setup your unit for the first time. This will help you get a better understanding of what you are looking at before purchasing a unit. Many people even pair the units with a battery and inverter to make a solar powered portable generator. This selection of solar charging kits includes the charge controller, attached legs and an easy carry case for stowing the portable kit when not in use.